Rooted in the campy theatrics of Alice Cooper and the sleazy hard rock of glam rockers the New York Dolls, Kiss became a favorite of American teenagers in the ’70s. Most kids were infatuated with the look of Kiss, not their music. Decked out in outrageously flamboyant costumes and makeup, the band fashioned a captivating stage show featuring dry ice, smoke bombs, elaborate lighting, blood spitting, and fire breathing that captured the imaginations of thousands of kids. But Kiss’ music shouldn’t be dismissed — it was a commercially potent mix of anthemic, fist-pounding hard rock driven by sleek hooks and ballads powered by loud guitars, cloying melodies, and sweeping strings. It was a sound that laid the groundwork for both arena rock and the pop-metal that dominated rock in the late ’80s. Kiss was the brainchild of Gene Simmons (bass, vocals) and Paul Stanley (rhythm guitar, vocals), former members of the New York-based hard rock band Wicked Lester; the duo brought in drummer Peter Criss through his ad in Rolling Stone and guitarist Ace Frehley responded to an advertisement in The Village Voice. Even at their first Manhattan concert in 1973, the group’s approach was quite theatrical; Flipside producer Bill Aucoin offered the band a management deal after the show. Two weeks later, the band was signed to Neil Bogart’s fledgling record label, Casablanca. 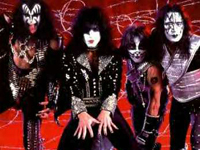 A 1977 Gallup poll named Kiss the most popular band in America. Kiss mania was in full swing and thousands of pieces of merchandise hit the marketplace. The group had two comic books released by Marvel, pinball machines, makeup and masks, board games, and a live-action TV movie, Kiss Meet the Phantom of the Park. The group was never seen in public without wearing their makeup and their popularity was growing by leaps and bounds; the membership of the Kiss Army, the band’s fan club, was now in the six figures. Even such enormous popularity had its limits, and the band reached them in 1978, when all four members released solo albums on the same day in October. Simmons’ record was the most successful, reaching number 22 on the charts, yet all of them made it into the Top 50. Dynasty, released in 1979, continued their streak of platinum albums, yet it was their last recorded with the original lineup — Criss left in 1980. Kiss Unmasked, released in the summer of 1980, was recorded with session drummer Anton Fig; Criss’ permanent replacement, Eric Carr, joined the band in time for their 1980 world tour. Kiss Unmasked was their first record since Destroyer to fail to go platinum, and 1981′s Music From the Elder, their first album recorded with Carr, didn’t even go gold — it couldn’t even climb past number 75 on the charts. Ace Frehley left the band after its release; he was replaced by Vinnie Vincent in 1982. Vincent’s first album with the group, 1982′s Creatures of the Night, fared better than Music From the Elder, yet it couldn’t make it past number 45 on the charts. Sensing it was time for a change, Kiss dispensed with their makeup for 1983′s Lick It Up. The publicity worked, as the album became their first platinum record in four years. Animalize, released the following year, was just as successful, and the group had recaptured their niche. Vincent left after Animalize and was replaced by Mark St. John; St. John was soon taken ill with Reiter’s Syndrome and left the band. Bruce Kulick became Kiss’ new lead guitarist in 1984. For the rest of the decade, Kiss turned out a series of best-selling albums, culminating in the early 1990 hit ballad “Forever,” which was their biggest single since “Beth.” Kiss was scheduled to record a new album with their old producer, Bob Ezrin, in 1990 when Eric Carr became severely ill with cancer; he died in November of 1991 at the age of 41. Kiss replaced him with Eric Singer and recorded Revenge (1992), their first album since 1989; it was a Top Ten hit and went gold. Kiss followed it with the release of Alive III the following year; it performed respectably, but not up to the standards of their two previous live records. In 1996, the original lineup of Kiss — featuring Simmons, Stanley, Frehley, and Criss — reunited to perform an international tour, complete with their notorious makeup and special effects. The tour was one of the most successful of 1996, and in 1998 the reunited group issued Psycho Circus. While the ensuing tour in support of Psycho Circus was a success, sales of Kiss’ reunion album weren’t as stellar as anticipated. Reminiscent of the band’s late-’70s unfocused period, few tracks on Psycho Circus featured all four members playing together (most tracks were supplemented with session musicians), as the band seemed more interested in flooding the marketplace with merchandise yet again instead of making the music their top priority.